Capitol Hill, with its rich history and iconic buildings, allows for an eclectic mix of professions. Jim Saenger, the Capitol's Carillonneur, has perhaps one of the most unique and least visible jobs on the Hill. His contractual agreement with the Architect of the Capitol, directed by the 1963 Senate Concurrent Resolution 25, states that he must annually play the Taft Carillon on July Fourth at 2 p.m. This interview provides a glimpse into his life as the Capitol's Carillonneur and an education on the carillon itself. The carillon is a unique instrument that isn't as well known as other instruments. Can you tell us how a carillon works and describe its different features? For me, the carillon is one of the more fun instruments to play. You have to think of it as a big keyboard instrument made out of bells. It's generally played from a large keyboard that resembles a loom in proportion and size. The carillon at the Taft Memorial has four possible functions, more or less typical for many installations. The first and most noticed function is the striking clock, which plays a tune and sounds the hours on the "bourdon" bell, the largest bell in the instrument. The second function is an automatic player that can be programmed to play simple tunes. The third function is the manual playing option. It's used to play music for special occasions. Lastly, the largest bell is mounted in a way that allows it to swing. 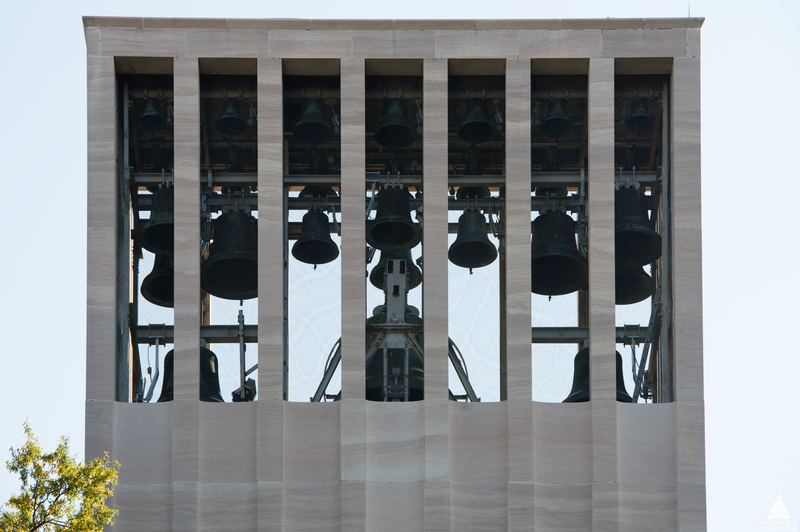 Weighing seven tons, the Taft Carillon has the largest swinging bell in Washington, D.C. Most people probably aren't aware of how many carillons there are nearby. How many exist in Washington, D.C. and the surrounding areas? 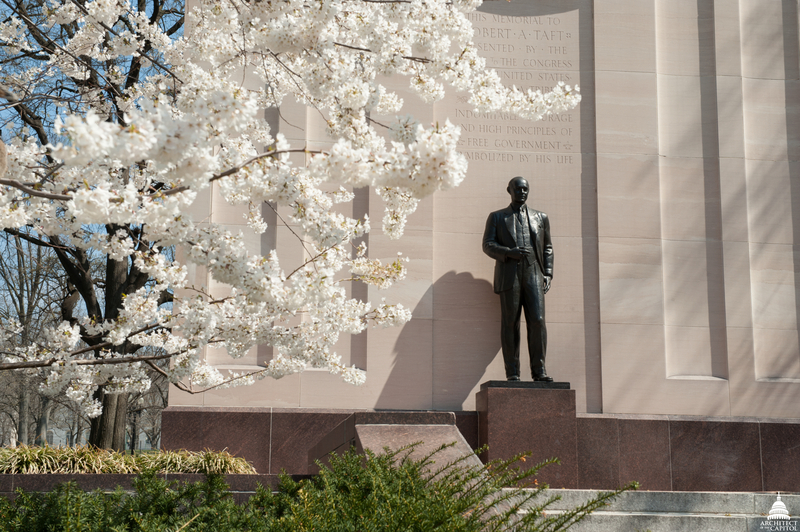 The Taft Memorial, installed in 1958, contains the first carillon installed in Washington, D.C. Earlier in the 1950s, the Netherlands Carillon was installed in Arlington, Va. In the 1960s, both the Washington Cathedral and National Shrine of the Immaculate Conception received large carillons. St. Luke's Methodist Church on Wisconsin Avenue also has a 30-bell instrument. The National Zoo has a smaller, high-pitched installation. For both number and weight of carillon bells, Washington, D.C., has more than any other city in the world. What's the most challenging feature of playing the carillon? The carillon can be tricky, because it is impossible to know how it sounds for the listener outside. A standard carillon has both manual and pedal keys, so you have the coordination requirements of the organ with the expression options of the piano. How many carillon players exist? At last count, there were about 250 of us in North America, with a similar number in Europe. There are more of us than you might think. You just don't see us — we are heard and not seen. How did your interest in carillons start? I grew up on a farm in eastern Pennsylvania and started playing the piano with my mother and then local teachers, working into the organ. The piano and organ, both keyboard instruments, were always interesting to me, especially the mechanics, so the carillon seemed like something to investigate. I first encountered a carillon at the age of 11 while checking out an organ installation. Organ building from a technical and mechanical standpoint was always interesting to me, so I did an apprenticeship in Bonn, Germany, in the late 1970s. I have played carillons all over the world including the United States, Germany, Belgium, the Netherlands, France and Switzerland. What do you enjoy most when playing the carillon? The music written specifically for the carillon seems most interesting to me. Most of this material is newer, since the 1950s. Arrangements of popular music will be recognized, but the real capabilities of the instrument can best be appreciated through its own literature. How did you become the Carillonneur for the Capitol? As a student of the carillon in Valley Forge, Pennsylvania, I became curious about other carillons close to home. I made inquiries about the Taft Carillon and then made arrangements to visit — that was in 1974 and I've been playing at the Capitol ever since. How often do you play at the Capitol? I play annually on the Fourth of July and have played at two inaugurations, for Presidents Carter and Reagan as well as an Easter recital in 1974. We tried out some holiday recitals in the 1970s, but Capitol Hill was often deserted in terms of a potential audience. I am available on an on-call basis, also for maintenance and adjustments. What songs do you play on the Fourth of July? I am required to play three pieces every year: the National Anthem, America and America the Beautiful. I also fill out the recital with other arrangements and literature to mark the special occasion. What emotions arise when you play for such historic, national events like the presidential inauguration? It's an honor and privilege to play for these events and, indeed, for Congress. As the only musician playing on the Fourth of July, the emotional content is a quiet and businesslike responsibility. You don't see or have a direct interaction with the audience when you play the carillon. Still, every event is interesting and exciting because you never know who you're going to meet and with access to the Capitol changing over the years, just getting here can be an experience. When I’m done playing there's always a moment when I realize that I’ve been part of a very significant event. More photos of the Taft Memorial. This story was first published in the Spring 2014 issue of AOC Foundations & Perspectives. YEAH! that's my friend! Way to go Jim! This is fascinating! What a great article! Love this info. I wonder if my husband knows about this? He worked for AOC. For 35 years. Very very interesting! Wonderful article! Wish that James Saenger could play our relatively new carillon at Denver University.